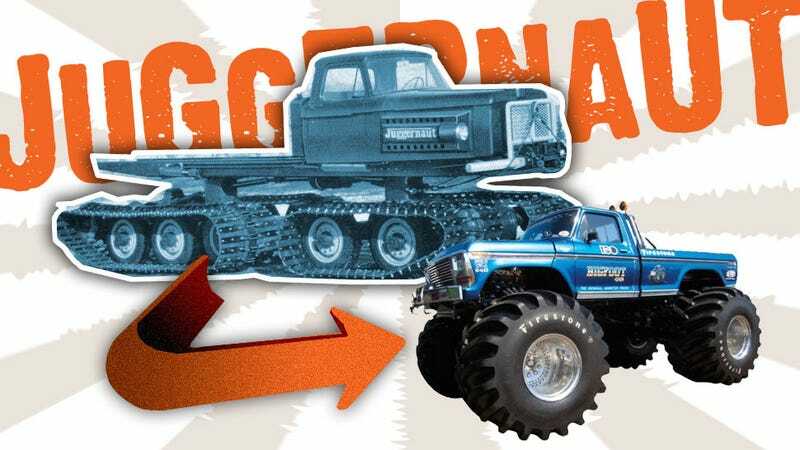 If we think of ‘monster trucks’ as regular pickup trucks that grow massive lower appendages due to intense monsterization, then I think we can say that one of the unsung early innovators if this trend was none other than Thiokol, makers of the Juggernaut. Oh, and there’s a DeLorean link here, too. They tried to make antifreeze, instead ended up with some really stinky gum, and then profit! It’s the American Dream. But we’re here to talk about these Ur-monster trucks, not stinky gum. That can go on Gawker’s new foul-smelling chewables blog, Stenchcud. The Logan division was Thiokol’s snow equipment and rough-terrain transport machinery arm, which grew from their military contracts. They made sno-cats and other sorts of equipment, but now I want to talk about their very, very modified pickup trucks. Really, the Juggernaut series were massive four-tracked go-anywhere machines that used production pickup trucks for their cabs. Early on, they seem to use Ford F-100 cabs, and later they moved to Dodge cabs. The ford ones had custom hoods (I dig those side-pods) and lighting, grilles, etc, while the Dodge cabs looked stock all the way to the front bumper. Speaking of which, it’s sort of hilarious they bothered to keep the front bumper at all, because what, exactly would that bumper be protecting the vehicle from? Second-story balconies? Elephant heads? Pretty much any car would be flattened to crunchy pancakes before even the antenna tip could scratch that bumper. The use of conventional truck cabs made these nearly 20,000 lb beasts relatively comfortable to sit in and drive, and I bet afforded options not normally found in vehicles like this — things like a radio and perhaps even heat and a/c. Also worth noting is that big V8 only allowed for a top speed of 21 MPH. Weight matters, people. And, I suppose, massive caterpillar tracks are a factor, too. More importantly, these things looked enough like massively lifted pickup trucks that I can’t help but wonder if they provided the inspiration for the Monster Truck movement that began in the 1970s. Hey, I almost forgot about the DeLorean link! The Logan division was bought by John DeLorean in 1978, mostly for its Sno-Cat business. Logan renamed it LMC (Logan Manufacturing Corporation), which I guess sounded good in his portfolio next to DMC (his time-machine platform company). There’s still a number of these around, and it would be really satisfying to show up at some parking lot full of lifted brotrucks with a Juggernaut 6T and just, you know, win. Forever.